Here's another Inspired by Nature card - this time I've made it 5-1/4" x 5-1/4". As in some of my previous IBN cards, I colored my image with markers, stamped on my white card stock, then took my water filled aquapainter, and went back over the stamped image to pull the color and soften in a bit. 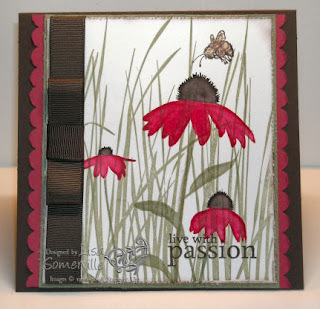 The bee used in on this card comes from Bloomin' Beautiful (this was featured in the Occasions Mini), I'm glad to see it made it into the Fall/Winter Catalog! Speaking of which - my UPS order with my Fall/Winter goodies should be arriving tomorrow! You aren't making it any easier for me to hold off on ordering this set. This is so pretty. I just love the colors. This is absolutely gorgeous! I've marked your cards all week as some of my favorites! Thanks for sharing!!! Lisa- I have been enjoying looking at all of the projects you have made with this set. OUTSTANDING!!!! TFS! Wow! another beauty! U r A bad enabler LOL! Enough! I have already decided to order this thanks to all your pulchritudinous samples. I would have never thought of ordering this on my own...but with you, what choice do I have??? ?